If nothing else, “The Mountain Between Us” does not dilly dally. Most movies about two strangers banded together after a plane crash in the wilderness might take their sweet time with the set-up, ensuring we get to know these people before they get to know each other. But no, just like Ben Bass (Idris Elba) and Alex Martin (Kate Winslet) forgo any small talk in deciding to charter a plane to Denver when all flights out of the Boise airport are cancelled, we are plunged directly into chaos alongside them and forced to play catch up when that chartered plane crashes. Furthermore, Kate Winslet’s reaction as her character realizes the plane is about to plummet, is the reason why we Winslet devotees stick with her through thick and thin. She says “Oh my God” not as a panicked wail but as a sudden, semi-matter-of-fact realization, like that thing you always see on TV is about to happen and she is about to live through it. It’s a helluva line reading; it is also as close as “The Mountain Between Us” ever gets to verisimilitude. That’s not so suggest the film, directed by Hany Abu-Assad, lacks authenticity. It was filmed on location in the Purcell Mountains of British Columbia and, boy, can you tell. Sweeping panoramas and snow-capped peaks loom in myriad shots, often accentuated in frames where cinematographer Mandy Walker repeatedly lets the vistas in the background dwarf the actors in the foreground. Even so, for the all peril into which Ben and Alex – really, just Alex – are often placed, it all feels oddly guarded. This is a movie where the happy golden retriever that comes along for the adventure not only never needs to eat but never has anything tragic befall it (spoiler!). 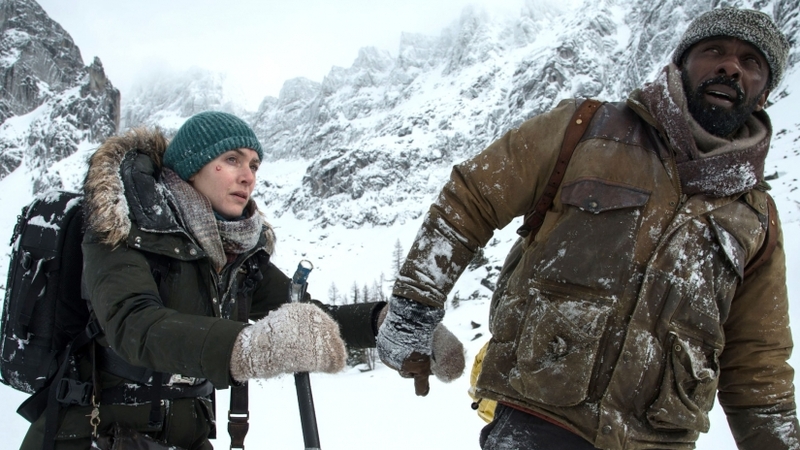 “The Mountain Between Us” might have been better off, frankly, filmed on a backlot rather than on location, especially because the further the movie goes the less it is about the elements than supposedly steamy romance. Romance of this sort is often generated by characters being at odds, and if initially Ben and Alex seem determined to work together, their life philosophies quickly reveal them as polar opposites. Alex, see, is a photojournalist with a propensity for wading into war zones, even on the doorstep of her own wedding, while Ben prefers level-headedly examining any given situation and then logically proceeding. This is to say, Alex thinks with her heart and Ben thinks with his head, the latter bludgeoned home by his profession as a, ahem, neurosurgeon. Naturally, this means Ben will have to open his heart to Alex, and so he does, though this seems to stem less from any kind of emotional or even physical attraction than a kind of doctor-patient relationship. She is injured in the plane crash so that Ben can tend to her, and when they decide, at her urging, to press forward, she suffers several close calls, less about the grueling reality of survival than Ben coming to her rescue. When Alex falls through some ice, it occurs in the immediate aftermath of Ben having discovered an abandoned cabin, as if this homestead was divined to ensure her safety before possible death strikes. So he hauls her out of the ice and to the cabin, where glowing fires illuminate their faces and, eventually, they surrender to passion, or something like it, I guess, because, much like the danger of their wilderness is frequently muted, so too are their animalistic urges. Elba and Winslet, granted, struggle to emit any palpable chemistry, but watching them kept making me think of “The Revenant”, which was no great shakes but which nevertheless yearned to instill a primal urgency. “The Mountain Between Us” desperately needed some primal urgency, even if it would have rendered everything as extra-ridiculous, because even if a few helpings of ridiculousness might not have saved this movie, it at least might have made it watchable.